In this “Words of the week” program, I will provide the theoretical framework on a new Chinese etymology which made Jason’s accomplishment possible. And, I will discuss a few words on their etymology in each post, of why they are written as they are and with the meanings as they are. The following words are teasers for the reader to contemplate about this new Chinese etymology. Can you get some ideas from this list? These few words encompass the entire points of this new Chinese etymology. Do spend some time to contemplate them. However, we should get a proper perspective of what this new etymology is all about first. This new Chinese etymology (CE) claims four revolutionary points. a. All Chinese characters are composed of from only 220 word-roots. b. The meaning of every Chinese character can be read out from its face by dissecting and decoding its composition. c. Every Chinese character carries a sound tag either explicitly or implicitly. d. By learning the three above, this new CE has transformed the most difficult language into the easiest one, from 6 years of humility to 90 days of enjoyment. Now, I should give a brief description about the humility of the old school ways first. The Chinese written language was always viewed as the most difficult language to learn, even for the Chinese people themselves. In 1920s, it’s illogical character structure was viewed as the culprit for China’s demise at the time. The slogan at the time was “without abandoning the Chinese characters, the China as a nation will surely vanish.” Qian_Xuantong (錢 玄 同 , http://en.wikipedia.org/wiki/Qian_Xuantong ), one of the greatest Chinese philologist in 1930s, even promoted the replacement of Chinese with Esperanto. 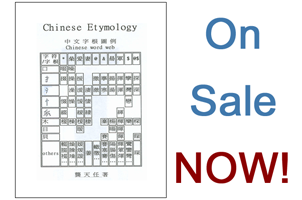 Finally, in 1958, a major effort to simplify the Chinese word system was launched. That is, at that time, no one in China knew that Chinese written language is an 100% root word system which “is” the most logic and the easiest language to learn in the world. Even with the above facts, one might still not get a sense of difference between this new etymology and the old schools. Thus, an article “Why Chinese Is So Damn Hard” (by David Moser, University of Michigan Center for Chinese Studies) can be of a help to know the difference between the two. It is an excellent article to read. Please do read that article, and you will appreciate this blog much better.